Uruguay pesticide importation (including formulations, TCs/TKs and adjuvants) decreased from 146.38 million USD in 2015 to 135.29 million USD in 2016. Import value grew from 61.89 million USD in 2006 and reached a peak of 254.03 million USD in 2014. 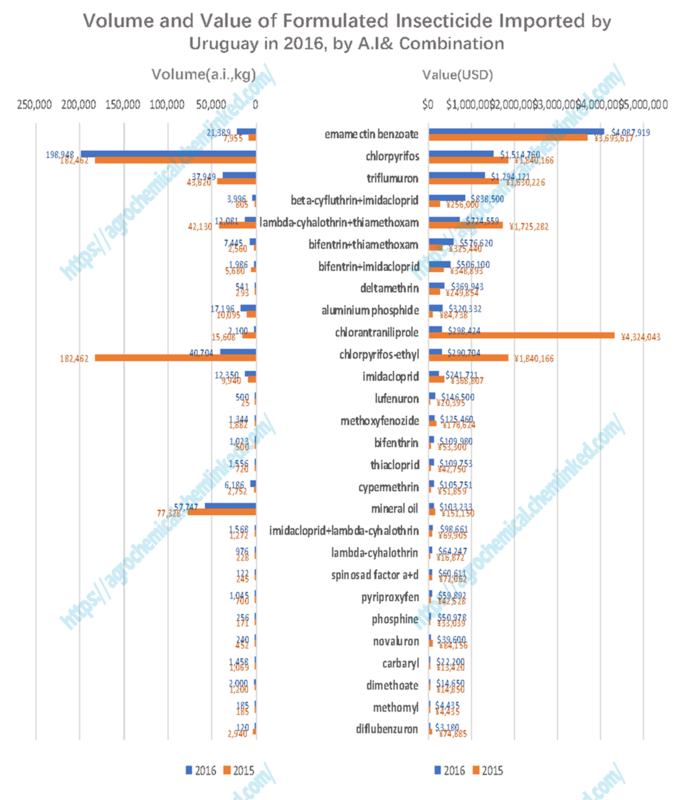 Although importation value has been unstable, the percentages of product categories were generally stable. Herbicide accounted for 60% of the total value, followed by fungicide (16%), insecticide (10%) and others (10%). 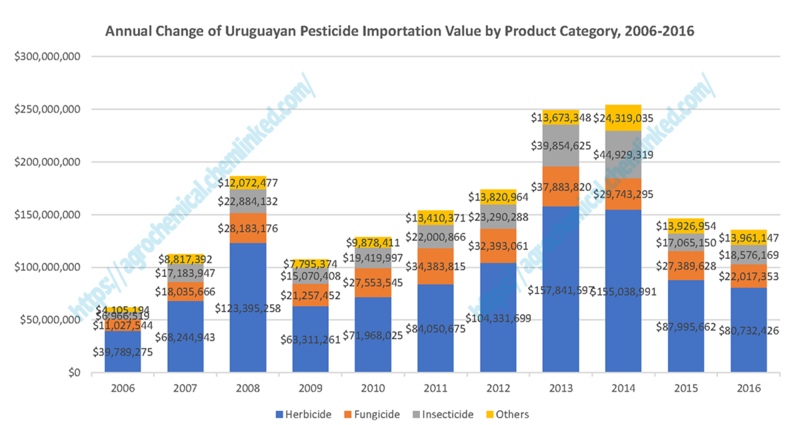 Uruguay imported pesticides and adjuvants from 27 countries in 2016. 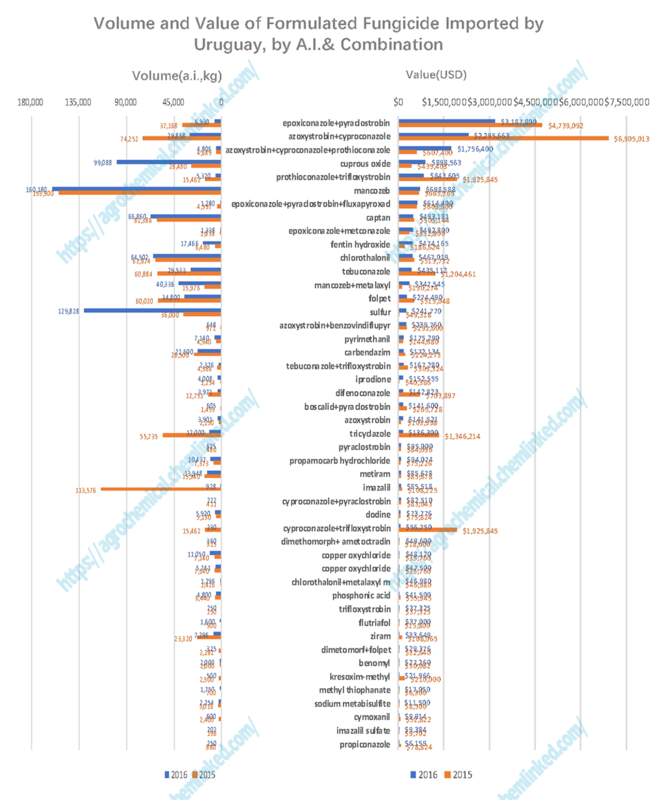 In value terms, most of the importation was from China (59.57%), followed by Argentina (17.34%), Brazil (6.21%), United States (5.86%) and India (1.81%), etc. 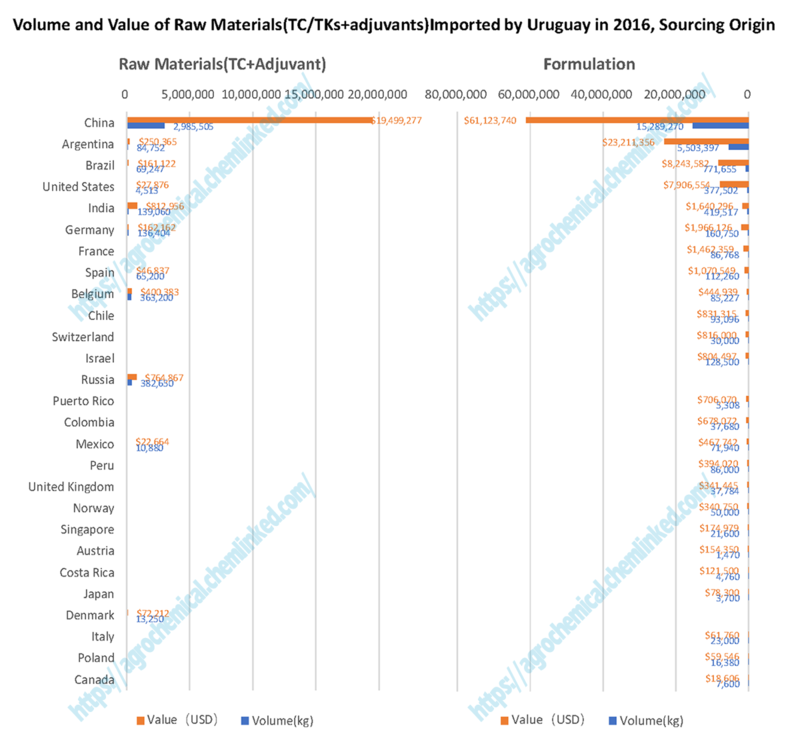 The TCs and TKs produced by China performed extremely well in the Uruguayan market and represent 90% of the value and 70% of the volume imported from China. From a price perspective, formulations from China were not only less profitable than that of developed countries such as United States, German and France, but also performed poorly in comparison to formulations imported from neighboring countries such as Argentina and Brazil. 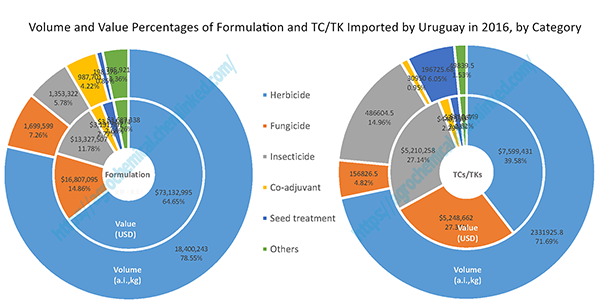 Brazil and Argentina import a large volume of TC/TKs from other countries, process the formulation domestically and then export to neighboring countries. In volume terms, importation totaled 27.68 tons, including 23.425 tons of formulation, 3,252 tons of TC/TK and 1,002 tons of adjuvants. Despite herbicide accounting for almost 80% of the volume of formulations, the average price (on a.i. 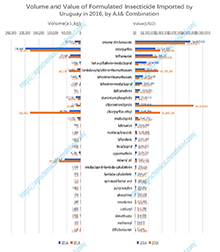 base) was 31% the price of fungicide and 23% the price of insecticide. The value percentages of fungicide and insecticide were 14.86% and 11.78%, with the other 10% being split among seed treatments, co-formulants, growth regulators, pheromone, rodenticide, soil fumigants and other niche products. The importation of herbicide formulation totaled 18,400 tons (11,665 tons of a.i. ), amounting to some 73.13 million USD. 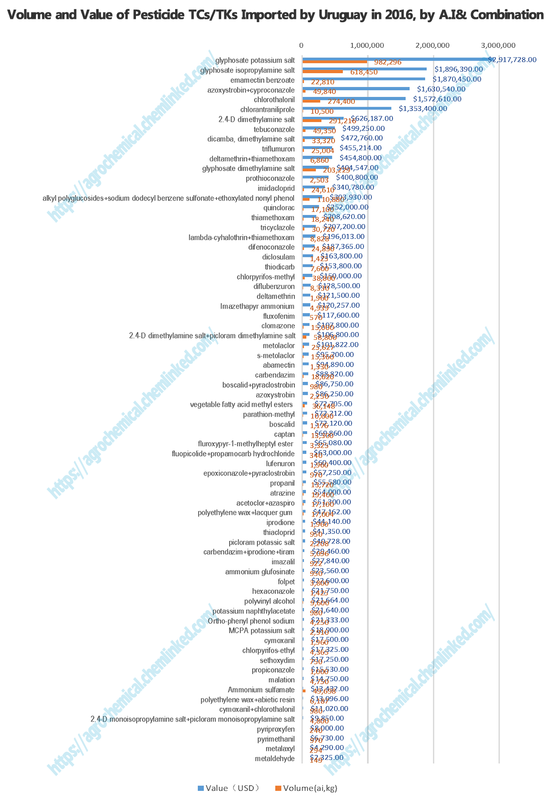 A total of 80 active ingredients/combinations were imported and the glyphosate family (glyphosate ammonium salt, glyphosate dimethylamine salt, glyphosate potassium salt and glyphosate isopropylamine salt) accounted for more than a half of the value. 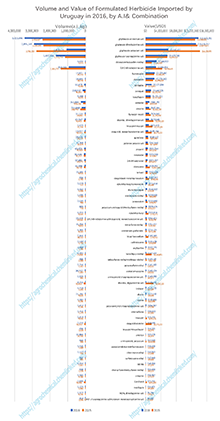 63 active ingredients/combinations were imported both in 2015 and 2016 and in terms of price most of them performed worse compared to the previous year. Average price of penoxsulam has declined by more than 80%. Herbicides which dropped 33% in price were: quinclorac, cyhalofop-butyl, metribuzin and haloxyfop-P. The value and physical quantity of fungicide were 16.81 million USD and 1,699 tons (850 tons of a.i. 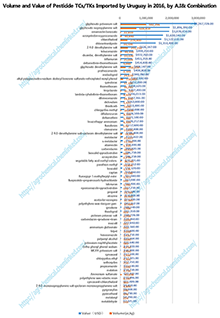 ).Three strobilurin and triazole combinations dominated the top 3 position in value ranks: epoxiconazole+pyraclostrobin(19%), azoxystrobin+cyproconazole(14%), azoxystrobin+cyproconazole+prothioconazole(10%). 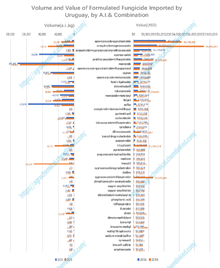 However, there was a fall in the price of most single compounded formulation of strobilurin and triazoles and the top declined active ingredients were: propiconazole, propiconazole, difenoconazole, flutriafol, tebuconazole, kresoxim-methyl and azoxystrobin. 46 insecticide active ingredients/combinations were imported, amounting to 1,353 tons (485 tons of a.i.) and 13.32 million USD. In value term, emamectin benzoate remained the most imported insecticide despite its price dropping by over 60% compared to the previous year. Chlorantraniliprole was subject to a decrease in both volume and price due to over-importation in 2015. Other active ingredients/combinations which experienced price declines were: lufenuron, imidacloprid, dimethoate, bifenthrin+ thiamethoxam, lambda-cyhalothrin+imidacloprid and chlorpyrifos etc. 4.254 tons or 22.22 million USD of raw material including TCs/TKs and general adjuvants were imported, of which 3,252 tons or 19.2 million USD of the TCs/TKs were processed into 8,526 tons of formulations. Pesticide processing occupies a small share of the market in Uruguay due to pricing pressures. The average price was only one third the price of fungicide and less than 10% the price of insecticide.